Kerala School and University youth festivals have assumed the dimensions of the biggest of their sort in Asia. However, the plagiarism and unhealthy approach in winning a first position and the title, Kalatilakam, have made them look down upon by any true lover of classical dances. Often, the title turns out to be a walk through to professional colleges. Against sage Bharata’s dictums, the competitions turn the minds of the participants, parents, teachers and the accompanying artists quite turbid. Over hundred twenty different art forms are presented from fourteen districts through four nights and days. Only the dance stages often turn out to be ugly war fields. In this scenario, Mela, an organization in the serene village area, made a fantastic strike through. As a New Year gift to dancers and dance lovers, the competition organized by the art promotion organization was a consolation packed with positivism and better hopes. Twenty participants each in Mohiniyattom, Bharatanatyam and Kuchupudi competed, dancing to recorded music. Two days passed by leaving a yearning for more. The organizers specified that the participants must have had traditional training in the styles under a renowned teacher and must have a clean track record of amateur level, class one performance. Out of the hundred and over applicants, twenty participants for each style were selected. Participants, their escorts were all given free hospitality and traveling allowance. The first position winners in each style were given a cash prize of Rs.10000 and the second position winners, a cash prize of Rs.5000.00. Kalamandalam Kshemavathy, Kalamandalam Leelamma, Kalamandalam Padmini, Kalakshethra Pushpaltha and Sindhu and Anupama Mohan and Geetha Padmakumar from the Kuchupudi Academy, Chennai, were the judges. All of them commented that it is for the first time, a very relaxed competition was judged by them. The participants maintained a high level of perfection, apt to their age and experience. 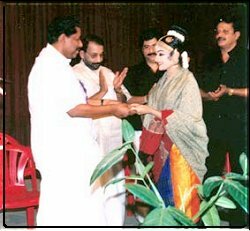 Divya Unnikrishnan was rated first in Bharatanatyam and second in Mohiniyattom. Indu Mohan and Indu Gopan were the first and the second position winners in Kuchupudi. Reshmi. T, scored first in Mohiniyattom. Unlike the tense atmosphere of the youth festival competitions, the surroundings of the auditorium echoed the scintillating and soothing music and the sound of the anklets. Everyone said that, this is how a competition has to be conducted and there was enough and more for the youth festival organizers to learn and practice. During the school youth festivals, each participant for each dance item spends fortunes, just to participate; not to comment that much more is needed to win a top position. “ To all who are bereaved, grief-stricken, tired of labour or even penance, as and when needed, there is the Natya Veda, to find solace and happiness”, proclaims Lord Brahma. Mela proved the creator right. The winners were felicitated and given the awards by the state minister T.M. Jacob, in the presence of the great veteran cine actor Nedumudi Venu and a group of tele - film artists. C P Unnikrishnan is a Kochi based Kathakali actor, critic and research scholar engaged at present in tracing the interlinks among the art forms of Kerala based on Bharatha's Natyasasthra.